St.Mark's Sr. Sec. 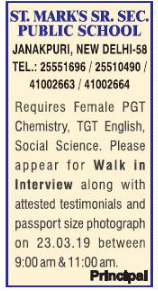 Public School, New Delhi has advertised in THE HINDUSTAN TIMES newspaper for recruitment of Teachers PGT / TGT jobs vacancies. Interested and eligible job aspirants are requested to walk-in on 23rd March 2019. Check out further more details below. About School : A school with the right environment goes a long way in shaping the life of a student. Tremendous effort and sacrifice is involved in establishing and maintaining a high quality institution. In the days when Janakpuri was taking shape very few facilities were available, farsighted Mr. T. P. Aggarwal visualized the need of an Educational Institution in this area. An institution which made its humble beginning more than 3 decades ago which today stands high with the reputation and glorious record for high quality education and with a student strength of about 3000 and a faculty strength of 150. Toil, goodwill & struggle of many people have gone into its making. The school is affiliated to the CBSE Board and runs classes from I to XII. Children are offered all the three streams - Humanities, Science & Commerce and are showing excellent results every year. How to Apply: Interested and eligible candidates are requested to appear for Walk-in interview along with attested copies of certificates / testimonials and recent PP size photos to the walk-in address provided here.